Silly "Nose Cup" Set gets the party started! Transform your face with these hysterical "nose jobs!" As you tilt the 12 oz. paper cups to take a sip, photo-realistic noses on cups appear to be your own! Whoever said, "You can pick your friends and you can pick you nose but you can't pick your friend's nose" needs to get with the program, what? 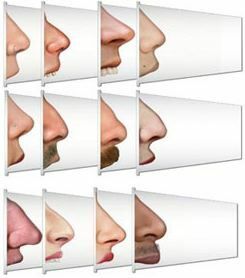 A set of 24, featuring "both male and female schnozzes," is $8.99.